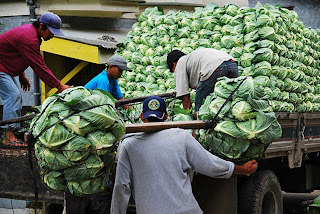 cabbage nutrition is of high nutritional value - knowing that cabbage consists almost only of water. The plain cabbage - now gets great reviews from the nutrition experts. 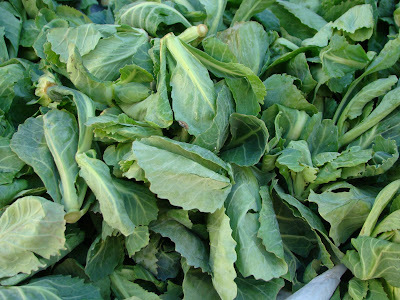 As inexpensive as cabbage is, it is one of the richest when it comes to protective vitamins. It is a good supplier of vitamin C and contains many more vitamins described below. It's low in calories with one cup amounting to only 15 calories. That Cabbage is of course a "slim" vegetable is evident. But did you know that cabbage supplies a lot of fiber, some protein, little carbohydrates and therefore doesn't entice the fat hormone Insuline? 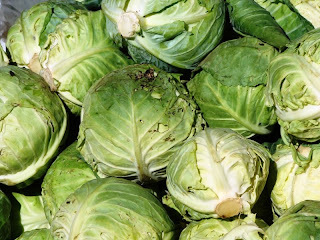 The Vitamine B in cabbage boosts your energy metabolism and helps your concentration. Another B vitamine is Folic Acid. It gives cabbage the image of a stresskiller and makes it ideal if you need brainfood. one cup raw coarsely sliced or shredded cabbage implies around 34 milligrams. Raw white cabbage suppplies as much vitamin C as lemon juice. Its vitamine C helps the mitochondriae (small power stations in your cells) to burn fat. The outer leaves are a great source of vitamin E, making it good for the complexion. Cabbage keeps you in good mood. The trace element Selen helps your body setting free second messengers for a good feeling and more happiness. Cabbage contains important Vital Substances for slimming like Calcium, Magnesium, Iodine, Cink and Iron. Vegetables have a lot of dietary fiber, also known as roughage. Cabbage contains a great deal of insoluble fiber too as cellulose. Humans can't digest it and it also doesn't dissolve in water. According researches this insoluble fiber raises bulk and eases the movement of body wastes through the colon and the intestines.